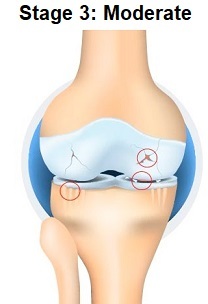 Osteoarthritis knee pain usually comes on gradually over a number of years. It is caused by thinning and "wear and tear" of the knee cartilage and bones. Knee arthritis affects more than 1 in 10 people. The symptoms of knee arthritis vary from person to person and the disease progresses at different rates in different people. 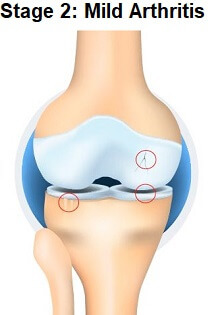 Knee osteoarthritis can be classified into four different stages, initial, mild, moderate and severe. Often mild arthritis will stay at that level, however, sometimes it progresses. 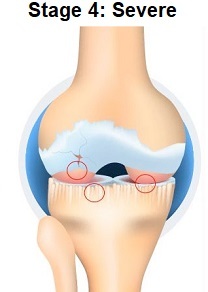 Here we will look at how the different stages of knee osteoarthritis are classified, how they differ from each other and the common symptoms at each stage. To find out more about arthritis, including symptoms, diagnosis and treatment options, visit the knee arthritis guide. Surprisingly, there is often very little correlation between the two. 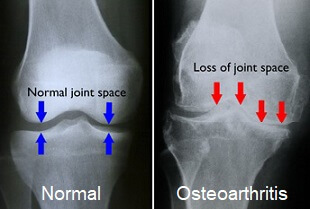 Some people demonstrate advanced arthritis on x-ray but have minimal symptoms, whereas other people suffering from a great deal of osteoarthritis knee pain may only show mild changes on x-ray. It is much more important to concentrate on your symptoms, rather than what your x-ray shows. In the very early stages, knee arthritis is often classed as being "doubtful", and people often don't notice any symptoms at all at this stage. Symptoms may consist of the occasional "twinge" in the knee but it most likely won't be affecting function. X-rays show little disruption and there will be less than 10% loss of knee cartilage. The technical term for this stage is Early Degenerative Changes. 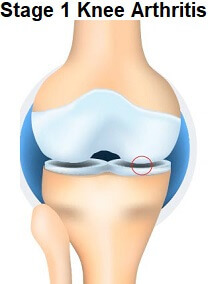 In the early stages of osteoarthritis of the knee, again, there may be no significant symptoms at all. Symptoms usually start with a generalised ache around the knee and stiffness, especially after prolonged periods in one position e.g. after sitting, when getting up in the morning or after lots of exercise. People often get pain when going down stairs or getting up from a chair. X-rays will usually show minimal changes to the bone and cartilage. There may be some mild narrowing of the joint space (the gap between the bones), and a few small one spurs may have formed. The cartilage will show signs of wearing away. There are a number of treatment options that can help reduce symptoms and stop progression of the knee arthritis at this stage. The technical term for this stage is Moderately Advanced Arthritis. Symptoms at this stage are more noticeable with moderate osteoarthritis knee pain. The knee may start to swell and/or stiffen. It may not be able to bend and straighten fully and sometimes the joint starts to make funny noises e.g. creaking or cracking noises. X-rays will often show moderate narrowing of the joint space and loss of the smooth surface of the bones with some osteophyte formation - bony knee spurs. Cartilage damage may extend down to the bone. Again, there are a whole range of treatment options including specially designed knee braces, injections and exercises that can help at this stage - visit the arthritis treatment section to find out more. The technical term for this stage is Advanced Arthritis. Symptoms can be quite intense by this stage. Osteoarthritis knee pain can end up so severe that normal daily activities such as walking and going down stairs become extremely painful and difficult. The knee can also become deformed. X-rays may show complete loss of joint space with a number of large osteophytes. Typically more than 60% of the cartilage is lost. This all leads to bone rubbing on bone which causes pain and limits movement. When this happens, the best course of action for osteoarthritis knee pain is usually a knee replacement.